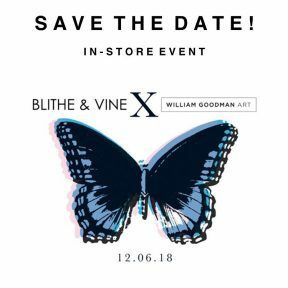 William Goodman will be in-store painting zip clutches with five of his designs exclusive to Blithe & Vine. We will also have for sale six one of a kind leather clutches that he created! This is the PERFECT gift for the art+fashion lovers in your life (including you)! Don’t miss out on such a unique experience! See you ladies there!